Happy Friday dolls! I recently moved and got rid of so many clothes, shoes, and bags that it left my closet bare. With a new schedule and commute, I've found myself in a total style rut, wearing the same shirts, sweaters, and jeans day in and day out. So I've been on a shopping frenzy these last two weeks to replenish my wardrobe and spice up my look. And with so many new styles popping up for spring, I'm adding more and more items to my shopping list (I only wish my wallet could keep up). 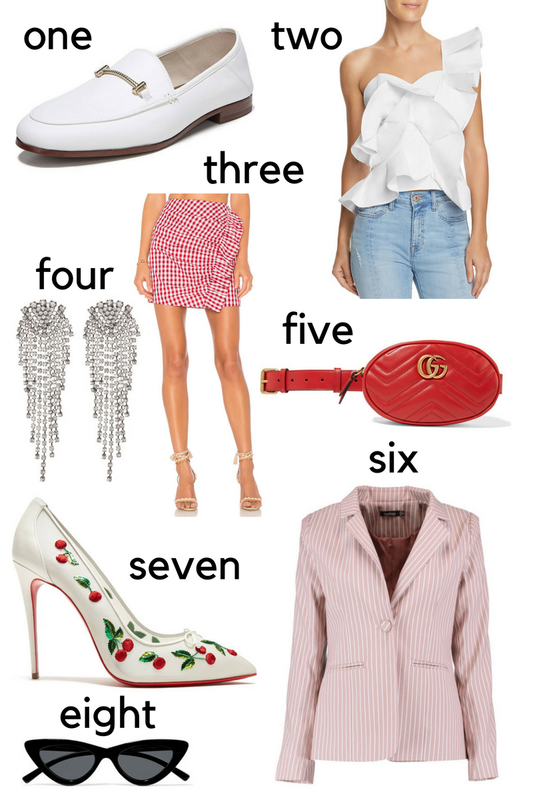 These are just a few of the items I have my eye on, including a couple of splurges (that are totally out of my budget, but a girl can dream), like these cherry embellished Louboutin pumps and the popular Gucci belt bag. I've also spied a bunch of spring deals and steals that are budget-friendly and would totally uplift my look, like this striped Boohoo Blazer in rose (so cute for a spring office look and under $40) and the Sam Edelman loafers (a great Look-For-Less option to the Gucci Horsebit loafers) that I've been obsessing over for weeks! Loving these bold candy striped wide-leg trousers. These will definitely take my spring look up a notch. And they're in my favorite color, pink! Since I'm always wearing jeans, I'm constantly on the hunt for a new and fresh take on the wardrobe staple. These red and white side-stripe skinnies would be a great way to add a little flavor to my denim lineup. I've been on the hunt for a stylish pair of affordable loafers. These mauve suede mule loafers are currently in my checkout cart (also love them in blue). Since I'm stocking up on flats this season, these red leather espadrilles are also on my radar. This pink color-block belt bag is the perfect accessory for a sporty chic look and such a steal for just under $30! "Dad" sneakers are the "It" shoe of the season for a casual street style look. These color-block trainers are super affordable at only $65 and the perfect option to try the trend for less. This season I'm totally obsessed with updating my wardrobe with more prints. These grey and cream plaid print pants (currently 40% off) are the perfect addition for an office-approved look (also loving this cream and grey check print high-waist mini skirt). It's open-toe season, even at the office. These blush pink block-heel ankle-strap sandals are the perfect fit to perk up a spring workday look.